Little Bit of History: Released in 1990, an action/platformer developed and published by Sunsoft. Based on the film of the same name. 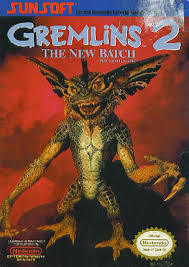 Gremlins 2 was quite an adventurous NES title and pushed the limitations of the console with it’s graphics, impressive cutscenes, audio and overall scope. Little Bit of Plot/Story: You played as Gizmo in full-on John Rambo mode, armed to the teeth battling your way through several levels based on the building from the movie. Fighting your way to take out all the Gremlins in the Control Room. Little Bit of Character: As well as the infamous and playable Gizmo. You would cross paths with rats, bats, various evil Gremlins…and giant bouncing tomatoes? Plus appearances in cutscenes from Billy Peltzer and Kate Beringer. Even old man Mr. Wing would appear in the form of a shop where you could buy items and weapons, even though he died in the film. Little Bit of Influence: Not really many games today that use this style anymore. But there have been other Nintendo Gremlins based games since including: Gremlins Unleashed – Gameboy Color, Gremlins: Stripe vs Gizmo – Gameboy Advance and Gizmo: The Game – Wii. Little Bit of Memories: While I never had a NES growing up, an old school friend did so I got to play the game occasionally. I still remember those well drawn and animated cutscenes as well as the music, but Sunsoft games on the NES always had great music. For Lee, my number 1 fan. Thanks for the: . 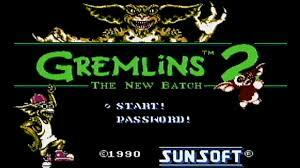 This entry was posted in LBoG: Game Overviews and tagged game reviews, Gremlins 2, Little bits of gaming, NES, retro gaming, Retro gaming blog, sunsoft on 08/05/2015 by Steve Perrin. Nice review. FYI you can pick this cart up on eBay from 7 pounds (unboxed) to 15 pounds (boxed). Gonna pick myself up a copy. Maybe that’s something to include in your reviews in the future? Let people know where they can get these retro games and systems, or maybe even talk about good emulators? Just throwing that out there for free. Also, anyone interested in this game should check out Sunsofts outrageously good Batman movie tie in on the NES. It’s about time we had an ale or two eh? It’s been a while. I do plan on adding a few new things to the site (when I have time), got plenty of ideas. Currently working on a new retrospective and a few games for the retro blog at the moment.